This article is about colorization of monochrome moving-picture images. For colorization of still images, see Hand-colouring. Film colorization is any process that adds color to black-and-white, sepia, or other monochrome moving-picture images. It may be done as a special effect, or to modernize black-and-white films, or to restore color films. Examples date from the early 20th century, but colorization has become common with the advent of digital image processing. It is an alteration of a finished work of art. The first film colorization methods were hand done by individuals. For example, at least 4% of George Méliès's output, including some prints of A Trip to the Moon from 1902 and other major films such as The Kingdom of the Fairies, The Impossible Voyage, and The Barber of Seville were individually hand-colored by Elisabeth Thuillier's coloring lab in Paris. Thuillier, a former colorist of glass and celluloid products, directed a studio of two hundred people painting directly on film stock with brushes, in the colors she chose and specified; each worker was assigned a different color in assembly line style, with more than twenty separate colors often used for a single film. On average, Thuillier's lab produced about sixty hand-colored copies of a film A Trip to the Moon, but only one copy is known to exist. The first full-length feature film made by a hand-colored process was The Miracle of 1912. These colorization methods were employed until effective color film processes were developed. During the late 1960s and the early 1970s, black-and-white Betty Boop, Mickey Mouse, and Looney Tunes cartoons were redistributed in color. Supervised by Fred Ladd, color was added by tracing the original black-and-white frames onto new animation cels, and then adding color to the new cels in South Korea. This technique considerably degrades the quality and timing of the original animation, to the extent that some animation was not carried over or mistakenly altered. The most recent redrawn colorized black-and-white cartoons are the Fleischer Studios/Famous Studios' Popeye cartoons, the Harman-Ising Merrie Melodies, and MGM's The Captain and the Kids cartoons, which were colorized in 1987 for airing on the Turner networks. With computer technology, studios were able to add color to black-and-white films by digitally tinting single objects in each frame of the film until it was fully colorized (the first authorized computer-colorizations of B&W cartoons were commissioned by Warner Bros. in 1990). The initial process was invented by Canadians Wilson Markle and Christian Portilla and was first used in 1970 to add color to monochrome footage of the moon from the Apollo program missions. Computerized colorization began in the 1970s with a process developed by Wilson Markle. Movies colorized using early techniques have soft contrast and fairly pale, flat, washed-out color; however, the technology has improved since the 1980s. To perform digital colorization, a digitized copy of the best monochrome film print available is needed. Technicians, with the aid of computer software, associate a range of gray levels to each object, and indicate to the computer any movement of the objects within a shot. The software also is capable of sensing variations in the light level from frame to frame and correcting it if necessary. The technician selects a color for each object based on (1) common "memory" colors such as blue sky, white clouds, flesh tones and green grass, and (2) based on any known information about the movie. For example, if there are color publicity photos or props from the movie available to examine, authentic colors may be applied. (3) In the absence of any better information, the technician chooses a color that fits the gray level and that the technician feels is consistent with what a director might have chosen for the scene. The computer software then associates a variation of the basic color with each gray level in the object, while keeping intensity levels the same as in the monochrome original. The software then follows each object from frame to frame, applying the same color until the object leaves the frame. As new objects come into the frame, the technician must associate colors to each new object in the same way as described above. This technique was patented in 1991. A major difficulty with this process is its labor-intensiveness. For example, in order to colorize a still image an artist typically begins by dividing the image into regions, and then assigning a color to each region. This approach, also known as the segmentation method, is time consuming, as the process of dividing the picture into correct segments is painstaking. This problem occurs mainly because there have been no fully automatic algorithms to identify fuzzy or complex region boundaries, such as between a subject's hair and face. Colorization of moving images also requires tracking regions as movement occurs from one frame to the next (motion compensation). There are several companies which claim to have produced automatic region-tracking algorithms. Legend Films describes their core technology as pattern recognition and background compositing which moves and morphs foreground and background masks from frame to frame. In the process, backgrounds are colorized separately in a single composite frame which functions as a visual database of a cut, and includes all offset data on each camera movement. Once the foregrounds are colorized the background masks are applied frame to frame in a utility process. Timebrush describes a process based on neural net technology which produces saturated and crisp colors with clear lines and no apparent spill-over. It is claimed that the process is cost effective and equally suitable for low-budget colorization, as well as for prime time broadcast-quality or theatrical projection. A team at the Hebrew University of Jerusalem's Benin School of Computer Science and Engineering describe their method as an interactive process which does not require precise, manual, region detection, nor accurate tracking and is based on the simple premise that nearby pixels in space and time that have similar gray levels should also have similar colors. At the University of Minnesota, a color propagation method was developed that uses geodesic distance. A highly labor-intensive process, employed by the UK-based film and video colorization artist Stuart Humphryes in conjunction with video restoration company SVS Resources, was employed by the BBC in 2013 for the commercial release of two Doctor Who serials – episode one of The Mind of Evil and newly discovered monochrome footage in the Director's Cut of Terror of the Zygons. For these ventures approximately 7000 key-frames (approximately every 5th PAL video frame) were fully colorized by hand, without the use of masks, layers or the segmentation method. These were then utilised by SVS Resources to interpolate the colour across the intervening surrounding frames using a part computerized/part manual process. The earliest form of colorization introduced limited color into a black-and-white film using dyes, as a visual effect. The earliest Edison films, most notably the Anabelle Butterfly Dance series were also the earliest examples of colorization, done by painting aniline dyes onto the emulsion. In 1916, the Handschiegl Color Process was invented for Cecil B. DeMille's film Joan the Woman (1917). Another early example of the Handschiegl process can be found in Phantom of the Opera (1925), in which Lon Chaney's character can be seen wearing a bright-red cape while the rest of the scene remained monochrome. The scene was toned sepia, and then the cape was painted red, either by stencil or by matrix. Then, a sulfur solution was applied to everything but the dyed parts, turning the sepia into blue tone. The process was named after its inventor, Max Handschiegl. This effect, as well as a missing color sequence, were recreated in 1996 for a Photoplay Productions restoration by computer colorization (see below). Partial colorization has also been utilized on footage shot in color to enhance commercials and broadcast television to further facilitate the director's artistic vision. As an example, Cerulean Fx provided partial colorization for Dave Matthews Band's music video The Space Between as well as Outkast's music videos Bombs Over Baghdad and Roses. A number of British television shows which were made in color in the early 1970s were wiped supposedly for economic reasons, but in some cases black-and-white telerecordings were made for export to countries that did not yet have color television. A notable example is the BBC's five-part Doctor Who story The Dæmons. Only one episode survived in color; the rest existed only as black-and-white film recordings. The only known color recording was a poor-quality over-the-air recording of an abridged USA broadcast. In the 1990s the BBC colorized the black-and-white copies by adding the color signal from the over-the-air recordings. The result was judged a success by both technicians and fans. In March 2008, it was announced that new technology, which involves detecting color artifacts ("dot crawl") in high-resolution scans of black-and-white films, will be used to restore other Who episodes as well as shows like Steptoe and Son where some episodes originally produced in color only exist currently in black-and-white. However, there are no plans to use colorization on BBC programmes originally produced in black-and-white, such as the 1960s Who episodes since they have no color information available and so cannot be recovered using these methods. The best one could hope for is an extrapolation of the methods used in colorizing the I Love Lucy episodes were a combination of color 8mm home-movie footage, staged publicity photos in natural color and the presence of surviving props and decorations from the show. In his feature film, The Aviator (2005), Martin Scorsese seamlessly blended colorized stock footage of the Hell's Angels movie premiere with footage of the premiere's re-enactment. The colorization by Legend Films was designed to look like normal three-strip film but was then color corrected to match the two-strip look of the premiere's re-enactment. Also in The Aviator, Scorsese used colorized footage of Jane Russell from the original black-and-white film, The Outlaw and dog fight scenes from Hell's Angels. 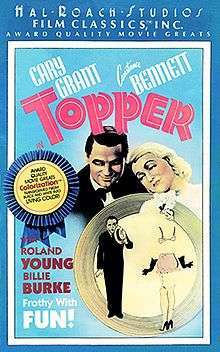 Re-released on home video by Hal Roach Studios in May 1985, Topper (1937) was the first black-and-white film to be digitally colorized. In 1983, Hal Roach Studios became one of the first studios to venture into the business of computerized film colorization. Buying a 50 percent interest in Wilson Markle's Colorization, Inc., it began creating digitally colored versions of some of its films. Roach's Topper (1937), followed by Way Out West (1937), became the first black-and-white films to be redistributed in color using the digital colorization process, leading to controversy. Defenders of the process noted that it would allow black-and-white films to have new audiences of people who were not used to the format. Detractors complained (among other reasons) that the process was crude and claimed that even if it were refined, it would not take into account lighting compositions chosen for black-and-white photography which would not necessarily be as effective in color. Figures opposed to the process included Roger Ebert, James Stewart, John Huston, George Lucas and Woody Allen. Cary Grant was reportedly "very gung-ho with the outcome" of the colorization of Topper. Director Frank Capra met with Wilson Markle about colorizing the perennial holiday classic It's a Wonderful Life, Meet John Doe and Lady for a Day based on Grant's enthusiasm. Colorization, Inc.'s art director Brian Holmes screened ten minutes of colorized footage from It's a Wonderful Life to Capra, which led Capra to sign a contract with Colorization, Inc. However, the film was believed to be in the public domain at the time, and as a result Markle and Holmes responded by returning Capra's initial investment, eliminating his financial participation, and refusing outright to allow the director to exercise artistic control over the colorization of his films, leading Capra to join in the campaign against the process. Colorization in 1986. 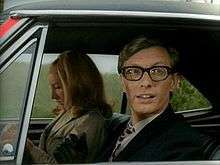 From Night of the Living Dead. Colorization in 2004 from the same film. In 1986, Film critics Gene Siskel and Roger Ebert did a special episode of Siskel & Ebert addressing colorization as "Hollywood's New Vandalism." Siskel explained how networks were unable to show classic black-and-white films in prime-time unless they offer it in color. "They arrest people who spray subway cars, they lock up people who attack paintings and sculptures in museums, and adding color to black and white films, even if it's only to the tape shown on TV or sold in stores, is vandalism nonetheless." Roger Ebert added, "What was so wrong about black and white movies in the first place? By filming in black and white, movies can sometimes be more dreamlike and elegant and stylized and mysterious. They can add a whole additional dimension to reality, while color sometimes just supplies additional unnecessary information." Media mogul Ted Turner was once an aggressive proponent of this process, by employing the San Diego firm American Film Technologies. When he told members of the press in July 1988 that he was considering colorizing Citizen Kane, Turner's comments led to an immediate public outcry. In January 1989 the Associated Press reported that two companies were producing color tests of Citizen Kane for Turner Entertainment. Criticism increased with the AP's report that filmmaker Henry Jaglom remembered that shortly before his death Orson Welles had implored him to protect Kane from being colorized. John Huston's opposition to the colorization of his work led to a landmark three-year French legal case after his death, sparked by a colorized version of The Asphalt Jungle. His daughter Anjelica Huston successfully used French copyright law to set a binding precedent in 1991 that prevents the distribution or broadcasting in France of any colorized version of a film against the wishes of the original creator or their heirs. Major legislative reaction in the United States was the National Film Preservation Act of 1988 (Public Law 100-446), which prohibits any person from knowingly distributing or exhibiting to the public a film that has been materially altered, or a black and white film that has been colorized and is included in the Registry, unless such films are labeled disclosing specified information. This law also created the National Film Registry. Both film and television restoration and colorization is produced by the company Legend Films. Their patented automated process was used to colorize around 100 films between 2003 and 2009. Shirley Temple, Jane Russell, Terry Moore and Ray Harryhausen have worked with the company to colorize either their own films or their personal favorites. Two movies that Legend Films are noted for is the colorization of the exploitation film Reefer Madness, for which certain color schemes were used to create a psychedelic effect in its viewers, and Plan 9 from Outer Space. Recently (2007), Legend Films colorized It's a Wonderful Life for Paramount Pictures (whose subsidiary, Republic Pictures, had regained control of the copyright in the 1990s) and Holiday Inn in 2008 for Universal Pictures. Colorization is sometimes used on documentary programmes. The Beatles Anthology TV show colorizes some footage of the band, most notably the performance of "All You Need Is Love" from the TV special Our World (1967). In the documentary this scene begins in its original black-and-white before dissolving into seemingly realistic, psychedelic color. The color design was based on color photographs taken at the same time as the special was shot. The documentary series World War I in Color (2003) was broadcast on television and released on DVD in 2005. There had previously been full-color documentaries about World War II using genuine color footage, but since true color film was not practical for moving pictures at the time of World War I, the series consists of colorized contemporary footage (and photographs). Several documentaries on the Military Channel feature colorized war footage from the Second World War and the Korean War. Andy Warhol for colorized photos or art. ↑ "The colorized cartoon database". Archived from the original on May 22, 2006. Retrieved 2007-01-01. ↑ "The History of the Motion Picture". About.com. Retrieved 2007-01-01. ↑ "Canadian Intellectual Property Office". Retrieved 2007-01-01. ↑ Daniel Sýkora. "Annotation of colorization methods". Archived from the original on 2010-11-06. Retrieved 2007-01-01. ↑ "Babelcolour Video Colourisation". 8 May 2013. Archived from the original on December 6, 2013. Retrieved 2013-11-15. ↑ Charles Norton (6 March 2008). "Putting colour back in the Doctor's cheeks". London: The Guardian. Retrieved 2008-03-14. ↑ "Doctor Who Restoration Team Official Site". Retrieved 2007-01-01. ↑ "Topper". AFI Catalog of Feature Films. American Film Institute. Retrieved 2016-06-28. ↑ Topper (Media notes). Hal Roach Studios Film Classics, Inc. 1985. It seems fitting that Topper should again be on the cutting edge of change, this time heralding the age of Colorization as the first completed Color version of a classic black and white motion picture. ↑ "Roach Enters Home Market". Billboard. April 13, 1985. Retrieved 2016-07-03. 1 2 3 4 5 6 Edgerton, Gary R. (Winter 2000). "The Germans Wore Gray, You Wore Blue". Journal of Popular Film and Television. Retrieved 2009-12-24. ↑ Krauthammer, Charles (1987-01-12). "Casablanca In Color?". Time. p. 3. Retrieved 2007-01-01. ↑ "Carpra's Movies Lead New Lives". MSNBC. Retrieved 2009-12-24. ↑ "AMERICAN FILM TECHNOLOGIES INC /DE/ – AFTC Annual Report (10-K) ITEM 1. BUSINESS". Sec.edgar-online.com. Retrieved 2009-11-01. ↑ Bawden, James, "Colorful Turner sees Citizen Kane in a different light".Toronto Star, July 28, 1988. "Citizen Kane? I'm thinking of colorizing it." ↑ "''The Museum of Broadcast Communications'': Ted Turner". Museum.tv. Retrieved 2009-11-01. ↑ "Turner Says It's Testing To Colorize 'Citizen Kane'". Associated Press, January 30, 1989. Retrieved 2014-01-05. ↑ "We'll Never Know If Rosebud Was Red". John Antczyk, Associated Press, February 14, 1989. Retrieved 2014-01-05. ↑ "The Complete Citizen Kane' documentary is now online". Wellesnet, May 13, 2013. Retrieved 2014-01-05. The footage appears at approximately 1:17:00. ↑ "The Complete Citizen Kane". British Film Institute. Retrieved 2014-01-06. ↑ Riding, Alan (25 August 1991). "Film Makers Are Victors In a Lawsuit on Coloring". New York Times. Retrieved 2009-04-24. ↑ "The Laurel and Hardy Collection". DVD Beaver. Retrieved 2007-01-01. ↑ "Stooges DVD revives colorization debate". MSNBC. Retrieved 2007-01-01. ↑ "Anthology Home Video". Beatles Reference Library. Retrieved 2007-01-01.